5.45 x 39 ammo is a military service cartridge that the Soviet Union introduced in 1974. This round was designed to function with the AK-74, AKSU 74, RPK 74 and AKS 74. The round the weapons chambered for it were initially designed to replace the AKM and AK 47 series of rifles, as well as some Soviet light machine guns. The 5.45x39mm round replaced the larger, heavier 7.62x39 cartridge. At the time of its introduction, modern militaries had been downsizing their munitions, with most of NATO going with the 5.56 cartridge. 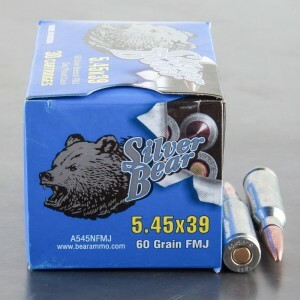 These smaller cartridges produced less recoil and muzzle flash, making full auto fire easier. They were also lighter in weight, allowing soldiers to carry bulk quantities of ammunition with less effort. 5.45 x 39 ammunition saw extensive use during the Soviet-Afghan war. The cartridge was used on both sides after the Mujahideen captured Soviet arms. Both sides used the caliber in the war. After that wartime use, many militaries concluded the 5.45 cartridge was very prone to excessive penetration, more so than the NATO approved 5.56 cartridge. The 5.45 x 39 cartridge has developed a growing cult of followers. The most common weapon seen in civilian hands is a semi automatic only AK 74 clones, as well as AKsu style pistols. The round has also found a limited number of AR rifles chambered in the round, like the Smith and Wesson M&P 15R. 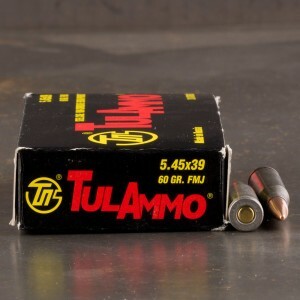 Typically purchased in bulk quantities for rapid fire range shooting, 5.45x39 remains popular today both in the United States and across the world. Night and day difference in accuracy next to imported competitors. Reliable in my ballistic advantage barreled AR build. Will buy again. Most accurate 5.45 on the market. Not only does my century AK74 love this ammo, but it gets here incredibly quick! Zero "keyholes" and relatively clean! Highly recommend! Have ordered from ATG several times and will continue to do so.